Ergogenix ErgoBlast Review – Should you take it? Anyone who has used pre-workout supplements has had their fair share of post-workout crash-related symptoms. That’s why any pre-workout product that promises a crash-free formula gets the attention of the bodybuilding community. 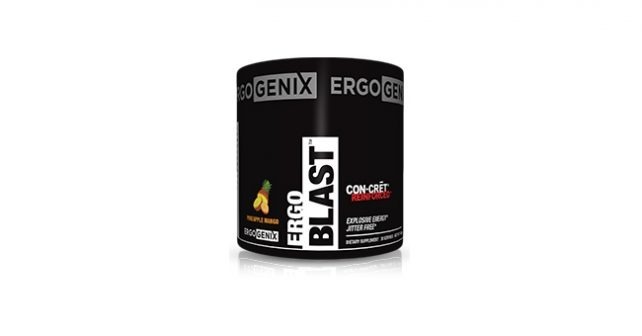 Ergogenix claims that its ErgoBlast formula contains a crash-free effect while having the same pump and focus expected out of a pre-workout formula. Ergogenix is a known name in the supplement industry. Its own pre-workout formula in ErgoBlast is designed to work in a stacked system with the other muscle-building supplements that Ergogenix developed. The main component of ErgoBlast is its stimulant blend that combines Tyrosine, Caffeine, and many other stimulants. Despite its claims that it has a crash-free formula, ErgoBlast has a whopping 300mg of caffeine in its formula. Caffeine is the primary reason why energy crashes take place. An energy crash or caffeine crash happens when your body is used to the stimulant effects of caffeine, and over time it wears off. By the time the caffeine wears off your system, your body will need quite some time to get used to its caffeine-less state. Sometimes gym time isn’t the highlight of our day and there are moments when we find ourselves dragging our butts to the gym. The effects of ErgoBlast lets you get pumped up and focused to motivate yourself to work out. ErgoBlast is also used by endurance athletes and bodybuilders to get the most out of their workout. We examined the composition of ErgoBlast and we learned that its main ErgoStim Proprietary blend is dominated by its caffeine anhydrous content, which is about 300mg, or equal to the amount of caffeine in a Starbucks Venti Brewed Coffee. This caffeine-heavy stimulant blend contradicts its crash-free claims. This amount of caffeine would immediately get your body dependent on caffeine for its stimulant effects, and once the caffeine wears off, you can guarantee that you’ll experience a crash. ErgoBlast also contains 1000mg of Creatine from Con-Cret, a product produced by Promera Sports. This should help your body replenish the energy expended from your muscles during workout. However, you cannot use ErgoBlast as a part of your creatine loading phase, but you can factor the 1000mg creatine content in your daily creatine intake, which should be about 5 grams per day. It also combines several B-Vitamins (B6 and B12) to optimize the conversion of food to energy. It’s interesting for the formula to contain a good amount of Zinc, which is believed to improve testosterone production. Sodium Citrate is also added to improve endurance and explosiveness. Apart from Caffeine, its ErgoStim blend also contains a myriad of other stimulants like L-Dopa, Tyhronesine, Theobromine, and many others that create a stimulant and a mild nootropic effect that makes you pumped up, yet you feel good while working out. A single serving of ErgoBlast is about $1 if you buy its 30-serving pack. Buy 10 singles and it would be about $1.63 per serving. The pricing is along the normal range, considering that it contains creatine and other stimulants. We scoured several review aggregate websites and found that we were pretty much on-point when we discussed about ErgoBlast’s claims that users are still prone to having caffeine crashes. There are several users that complained about the nasty crash that happened the day after. All in all, ErgoBlast is a good enough pre-workout supplement. It just bothers me that they had to falsely market their product by claiming it has a crash-free formula when it doesn’t. It’s great to stack it with NO boosters and Testosterone boosters because of its Zinc content. Stack ErgoBlast with the best supplements for muscle building like NitroGenix 365 and Xtreme Testosterone. Take your muscle-building supplements daily and take ErgoBlast before working out and experience the difference in strength and pump.